Too often, nurses are unsung heroes of the medical community. In fact, they are key members of any healthcare team, but their skills and contributions go unrecognized time and time again. New Hampshire Magazine, in partnership with the New Hampshire Nurses Association, wants to help change that with the Excellence in Nursing Awards. This past winter, we accepted nominations for New Hampshire nurses in 13 vital specialties, from pediatrics and public health to leadership and education. The winners were selected by an independent committee of nursing leaders from adjoining states. Each nurse profiled here represents the very best in nursing — those who go above and beyond to comfort, heal and teach. Being in palliative and hospice care is both challenging and fulfilling. It requires clinical and communications skills, good boundaries, and more importantly, the ability to remain present in difficult situations. Barbara Stuart, nurse coordinator at Wentworth Health Partners Palliative Care Practice, encapsulates all of these qualities. Stuart educates and supports patients, families and staff while ensuring that providers are able to efficiently deliver care in multiple locations. After working in hospice nursing for five years, Stuart transitioned into the growing field of palliative nursing in 2007. “I’m inspired every day by the patients we see who continue to live their lives to the fullest,” notes Stuart. “At some point, we will all have our own illnesses and must pray there will be someone there to support both ourselves and our loved ones.” Being present in a family’s most intimate and heartfelt moments is an inspiring gift, and Stuart says that it is imperative to educate the next generation of nurses about this special field of care. For most, a career means working at one thing. For Carmen J. Petrin, she combines caring for patients with teaching her considerable skills and knowledge to others. As a nurse practitioner, she works with cardiologists at the New England Heart and Vascular Institute, managing the care of patients with cardiovascular disease. When wearing her teaching hat, she’s a clinical education specialist at Catholic Medical Center where she has taught programs on cardiovascular nursing. As an American Heart Association Advanced Cardiac Life Support (ACLS) instructor, she has taught courses to healthcare providers who care for victims of cardiac arrest and cardiovascular emergencies. She started her career as a staff nurse, eventually becoming an instructor at a nursing school, but she says her career really began when she became a critical care educator and ACLS Instructor in 1982. A few years later, in 1986, she was a part of the team that designed and implemented the institute’s successful cardiothoracic surgical program. It was in 2005 that she became a nurse practitioner. Resource nurses, like Heather Brander, are advocates for patients, families and staff, and are mentors and preceptors all in one. A typical day in the hospital includes making daily assignments for nurses, working with multiple staff members from varying departments, organizing and keeping tabs on secretaries and being available for questions, concerns and assisting with family dynamics. For over 20 years, Brander’s humble and selfless attitude has carried her far beyond the call of duty in her position in the Geriatric Psychiatric Unit at Elliot Hospital. Although her primary role is Clinical Nurse Leader, she also serves as sexual assault Nurse Examiner Coordinator and staff RN at the Elliot Emergency Department. Along with all those “hats,” nursing is a second career for Jennifer Alicea. She was in her 20s working as an accountant when she went back to school and took a substantial pay cut to pursue her passion for nursing. Labor and delivery nurses assist in bringing new life into the world every day. Hambrecht Lourdes, a labor and delivery nurse at The Birth Place at Southern New Hampshire Medical Center, enjoys being a part of a family’s birth story — an experience that she holds close to her heart. Lourdes graduated from the University of Rhode Island in 1999 with a Bachelor of Science in Nursing. After passing her NCLEX exam and receiving her registered nursing license, Lourdes worked in a high-risk obstetrical unit. The job provided her with a solid foundation to build her career on and over 18 years later, she still finds the same joy in it that she had on day one. Before calling the Monadnock Region home, photographer Kendal J. Bush traveled the world as an editor and videographer for the National Geographic Channel and NBC. She combines years of experience as a photojournalist with her film school education to yield colorful, creative portraits and corporate, wedding and event photography. 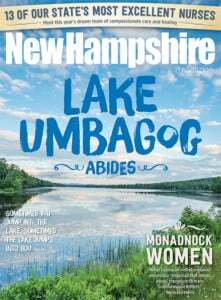 Her work is frequently featured on the cover of Parenting New Hampshire magazine and in the pages of New Hampshire Magazine’s Bride. Thank you to those who joined us on Tuesday, May 22, 2018 to celebrate this year’s award recipients at the inaugural Excellence in Nursing event. Thank you also to the New Hampshire Nurses Association for their guidance and support. Photos from the reception were taken by Wendy Wood.